internal baffles that give the gases a long, hot enough route so that they can burn completely. Non-catalytic wood stoves, in their most basic version, are a campfire in a box. These units rely on a controlled supply of pre-heated air to various points along a serpentine path in the combustion chamber for optimum conversion of fuel to heat. Advantages are a simpler construction, fewer/cheaper parts that need replacing, and lower, simpler maintenance. 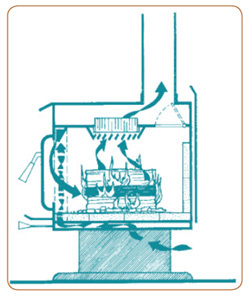 Disadvantages vs. a catalytic wood stove include: slightly lower efficiency due to necessary higher combustion temperatures, a narrower range of optimal firing rates, and relatively shorter burn times. 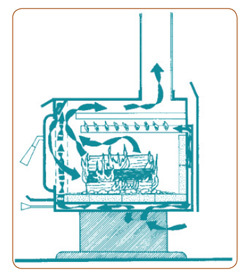 Catalytic wood stoves have a brick-like catalyst, which increases the surface area and lowers the temperature where the combustible components in the wood smoke can be burned. While smoke usually ignites at approximately 1100 degrees F, the catalyst lowers that temperature to approximately 500 – 550 degrees F. Advantages are increased efficiency, longer burn time, and the ability of the unit to burn cleanly at lower firing temperatures. A disadvantage is the need to replace the catalyst roughly every 600 hours at a cost of between about $100 and $200. Learning to use the catalyst and adjusting the unit to optimize efficiency is slightly more complicated than the traditional non-catalytic stove. Pellet stoves are similar in dimension to wood stoves. They use compressed pellets (made from wood or other biomass (made from plants, agricultural waste, or other vegetation)) for fuel. Pellet stoves have a variety of mechanical fuel-delivery and ash disposal systems, are equipped with sensors to help control air intake, and can be either fireplace inserts or free-standing stoves. The controlled air intake results in a relatively controlled and clean burn. If used correctly, pellet stoves produce very little smoke and creosote, the latter being the main cause of chimney fires. They are categorized into two types based on the pellet delivery systems: top-fed and bottom-fed. 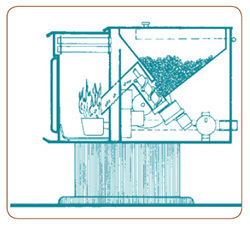 Bottom-fed units feed automatically into the stove, while top-fed units commonly have a hopper that is manually refilled with bagged pellets. Unlike wood stoves and fireplaces, pellet stoves need electricity to operate, but they can be easier to operate and maintain. Pellet burning involves no cutting, less hauling, and no splitting, stacking or waiting for the wood to dry, but requires the purchase of pellets. Masonry heaters have two features that set them apart from other types of combustion equipment. The first is apparent on the outside: they consist of a large amount of stone, bricks or refractory material. The second is concealed on the inside: they are designed with a system of channels through which the hot flue gasses travel before going up the chimney or stovepipe. Together, these design features make for very efficient, clean burning heaters. Masonry heaters still have a firebox, where wood is burned. But unlike wood stoves, they take a very long time to heat up, though. The large thermal mass (the bricks or stone cover a frame of firebrick) may take a full day to heat up. The thermal mass will also hold that heat for a very long time (and is warm to the touch, versus burning hot on a wood stove). One or two short duration but intense fires per day will maintain comfortable, even heat that radiates in all directions. Some masonry heaters have built-in cooking compartments ideal for baking bread or making stews. The downside of masonry heaters is their higher price, size, and weight. Unless they are built on the house foundation, substantial reinforcements are needed for conventional buildings and a structural engineer is required. Commissioning someone to build a custom masonry heater can cost $15,000 to $30,000. Kits are available for the core of the heater (starting around $5,000). A conventional fireplace is typically a masonry or metal box with an attached flue and chimney. An open fire is built in the box and radiates heat into the room. These systems are typically very inefficient because the fire also causes a draft of conditioned room air to vent out the chimney, and because an open fire combusts fuel inefficiently. A fireplace insert is a wood stove that has been modified by its manufacturer to fit within the firebox of a masonry fireplace. Inserts are used to convert masonry fireplaces, into more effective heating systems. An insert consists of a firebox surrounded by a steel shell. Air from the room flows between the firebox and shell and is warmed. The outer shell ensures that most of the heat from the firebox is delivered to the room instead of being released up the chimney. Efficiency of inserts varies tremendously, with most only 50% of a wood stove. There are basically two kinds of wood-fired boilers: the standard hydronic heater, commonly known as an outdoor wood boiler, and two-stage gasification cord wood or pellet boilers. Within each category, there can be a wide range in terms of emissions, efficiency, cost, and heat output. Boilers heat water or glycol (antifreeze), which is circulated through pipes to the space to be heated or into a heat exchanger in a forced-air system (though this is often less efficient). While Outdoor wood boilers (OWBs) are often advertised as a clean and economical way to heat one’s house and water, OWBs can also be among the dirtiest and least economical modes of heating, when improperly used. Some suffer from design characteristics that make them notorious for having very high emissions and low efficiencies. They are based on a large firebox, surrounded by a water jacket, which is often not well insulated; and they usually have low chimney stacks, which allow exhaust to hover close to the ground. Currently, there are no nationally established legal emissions limits for OWBs. When used improperly – such as burning wet wood or other inappropriate fuels – the hourly emissions of one (OWB) can be twenty times as high as the hourly emissions of an EPAcertified wood stove. They should be used with dry wood and adequate air intake to maximize efficiency and minimize emissions. While the EPA has initiated a voluntary regulatory program in an effort to encourage manufacturers to produce cleaner, more efficient units, there are still many unqualified, polluting boilers on the market. Be cautious when purchasing and installing one of these systems. Europeans lead the world in the development and use of two-stage gasification boilers, and many of which are available for import. In addition, several domestic companies are now making very clean-burning, highly efficient units. Many boilers employ thermal storage to improve efficiency by minimizing the frequency of on-off cycling. These are usually large, insulated buffer tanks that store heated water (such as a tank-style water heater) before circulating it throughout the building. Without thermal storage the heater would have to fire up any time there is demand, which means the heater cycles on and off frequently. With thermal storage, the boiler fires for a long period of time in order to heat the large amount of water in storage, and then shuts down for a long period of time while heat demand is satisfied through the stored heat energy. This greatly increases efficiency and reduces emissions. Source: Canada Mortgage and Housing Corporation (CMHC). A Guide to Residential Wood Heating, 2008 (About your House: Combustion Gases in Your Home, 2006; About your House: Efficient and Convenient Wood Heating, 2009). All rights reserved. Reproduced with the consent of CMHC. All other uses and reproductions of this material are expressly prohibited.